Assassin’s Creed is a rare bird when it comes to yearly release titles. It’s a single-player-focused action title in a sea of multiplayer shooters. This does not mean the quality is any better than some of those shooters. Assassin’s Creed Unity is not better. Developed by Ubisoft Montreal, Assassin’s Creed: Unity is a third-person action title that follows assassin Arno Dorian during the time of the French Revolution. Players will experience Arno’s rise from cheeky young man to master assassin. This journey will rarely be enjoyable. Problems plague the game everywhere from the poorly explained story, to the basic gameplay elements, and to the weak multiplayer element. The story is hardly accessible to new players of Assassin’s Creed. The game is rife with annoying controls and frustrating situations. The multiplayer element completely fails in execution because of the gameplay. Let’s start with discussing the story. The game opens with you selecting some memories to play inside of Abstergo’s new form of entertainment. The problem is, it doesn’t explain what Abstergo is or the concepts behind genetic memory. If you are a new player to the world of Assassin’s Creed, this game will not help you in the least. Throughout the game, concepts are thrown out that would easily fly over the head of those not familiar with the series. No one expects a game in a “historic” setting to have a sword that shoots lightning, but this one does and it fails to explain that it’s a “Piece of Eden.” The game treats the player like they should already have intense knowledge of the Assassin’s Creed lore. The only reason I point this out is because Unity seems to be a likely candidate for bringing in new players. A multiplayer-focused Assassin’s Creed would draw both fans and, potentially, their friends that have no Assassin’s Creed experience, but still would like to play with them. This influx of new players would warrant a bit more explanation. But, even if the story was perfect, the gameplay would be hard to make up for. Returning are the basic concepts of free-running around the city and simple combat. These are the parts with the most problems. While free-running, Arno would often automatically go where I did not want him to go. This was most painful when I was trying to do basic actions like walk down a staircase and assassinate a guard. Instead of simply walking, Arno would hop onto the hand rail, spin around a few times, and then perform a flying leap to assassinate someone other than my target. This happened quite often due to the “stickiness” of the environment. Often, as a result of failed free-running, I’d alert a guard and start a bad round of combat. I found most combat to be either unplayable or boring bouts of “parry, parry, parry, parry, parry” that went on for way too long. If you encounter more than 3 enemies at one time, you are forced into a heavily defensive fight. If you encounter these enemies in a back alley, you can forget winning the fight as the “combat-camera” frequently puts enemies out of sight, allowing them to attack without warning. Escape is made just as hard because of camera issues. The multiplayer just serves to enhance these problems. If you think making one Arno walk down the stairs is hard, try coordinating it with three other people. The multiplayer missions are usually just larger variants of the same types of missions in single-player. The problem is every player has to do their part perfectly or it devolves into 4 assassins sword-fighting in the street with an army of thugs. It doesn’t make for good pick-up-and-play multiplayer with random online players and the effort is not rewarding enough to warrant proper coordination. The “unique” customization elements are also too simple to be enjoyable. Every assassin will eventually have the same skill set and the only real customization comes from dressing up Arno and the choice of one of very few “group skills.” Everything else is negligible. The game, however, does have some fun elements, particularly the big assassinations. Multiple routes and options are provided and if your controls behave for one session, it can be rewarding to slip into an area, stab your target, and sneak out. There are very few of these missions and they very rarely work out the way you hope. Despite having strong foundations in other iterations, Assassin’s Creed Unity does not feel like a strong, polished game. Combat has gotten sloppy and the controls are frustrating. The multiplayer elements just serve to exacerbate these problems. I managed to find some fun in plotting the big assassinations when my controls would respond, but it wasn’t enough to save the game. 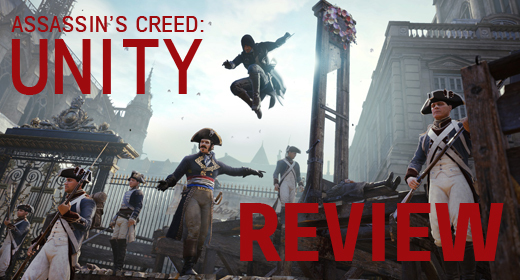 Assassin’s Creed: Unity misses its mark with a 3/10.